Your kidneys contain millions of minute blood vessels that filter waste products from your blood. But diabetes can damage these amazing organs, so they lose their filtering ability. How is kidney disease caused and what can you do to prevent or reverse the damage? To keep your body functioning properly, waste products and excess fluid must be removed on a regular basis. To do this, you have two bean-shaped kidneys … each about the size of your fist … located on either side of your spine just below your rib cage. Your kidneys filter and return to the bloodstream about 190 litres of blood every day. In doing so they produce up to 2 litres of urine that contain the waste products your body needs to get rid of. 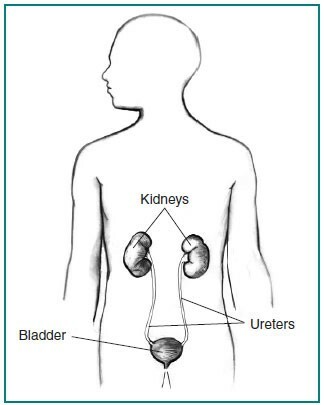 The urine flows from your kidneys to your bladder. Once your bladder is full, you get an urge to pee and the urine and the wastes it contains leave your body. 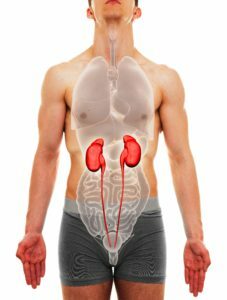 Why are your kidneys vital? But your kidneys do much more than simply remove waste products from you bloodstream … they stabilize the make-up of your blood. This is critical to keep your body functioning properly. How do your kidneys filter your blood? The heart pumps about five litres of blood a minute under resting conditions. Approximately one litre (20%) enters the kidneys for filtering. 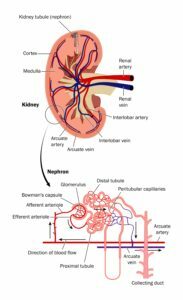 Each kidney contains about a million functioning units called nephrons. Each nephron filters a tiny amount of blood. A nephron contains a glomerulus (which is the actual filter) and a tubule (a tiny tube). The nephron works in a two-step process. Blood from your bloodstream enters the glomerulus. The glomerulus allows fluid and waste products to pass through but it prevents blood cells and large molecules, such as proteins, from getting through. The filtered fluid then enters the tubule which contains a long series of ducts. In the tubule, various chemicals and water are added or removed from the filtered fluid according to your body’s needs. The fluid, containing wastes, then exits the tubule as urine and flows to the bladder. Uncontrolled high blood glucose and high blood pressure are, by far, the most common reasons for deterioration in kidney function. But there are plenty of things you can do to prevent the destruction of your kidneys. In the first step of the filtering process, the glomerulus prevents bloods cells and large molecules (eg, proteins) from passing through to the second step. Uncontrolled diabetes can damage this system. High levels of blood glucose make the kidneys filter too much blood. The extra work is hard on the kidneys and after years they start to leak and protein gets through into the urine. Eventually the stress of overworking causes the kidneys to lose their filtering ability. As a result waste products start to build up in the blood. Eventually the kidneys fail and you reach end-stage renal disease (ESRD). Uncontrolled hypertension causes chronic kidney disease in a similar manner. How can kidney disease be detected? Kidney disease presents few symptoms until almost all kidney functions are gone. This is because the kidneys work hard to cover for the filters that are failing. These symptoms, however, are not specific to kidney disease and could relate to several other diseases. A test for protein in the urine … too much protein in your urine suggests that your filtering units have been damaged. Calculating your glomerular filtration rate (GFR), a measure of kidney function … you are tested for creatinine (a substance that helps your muscles produce energy and which builds up as a waste in your blood when your kidney function is reduced) … the results, combined with other factors, are used to calculate your GFR, ie how well your kidneys are functioning. A blood urea nitrogen (BUN) blood test … BUN is another waste that builds-up in your bloodstream when your kidney function is reduced. The secret is to have your blood glucose levels and blood pressure under control. Doing so can help to prevent kidney disease or keep it from getting worse. The most important treatments for kidney disease are to keep tight control of your blood glucose levels and blood pressure. The best way to keep your blood glucose levels under control is to follow the Beating Diabetes Diet ….. a plant-focused diet consisting of natural (non-processed) foods that are … low in sugar … low in fat … low in salt … high in fibre … have a low GI … contain only a little meat … washed down with lots of water … excluding eggs and all dairy products (milk, cheese etc). The same diet will help you control your blood pressure. If you manage to get control over your diabetes and hypertension, you will slow the deterioration in your kidney functions and perhaps even stop it from getting worse. If, after changing your diet and lifestyle, you are still having problems with your blood pressure, you can get a prescription from your doctor for medicines that will control your blood pressure. Several kinds of blood pressure drugs are available. However, not all are equally good for people with diabetes. Some raise blood glucose levels or mask some of the symptoms of low blood glucose. Doctors usually prefer people with diabetes to take blood pressure drugs called ACE inhibitors. Indeed, ACE inhibitors are recommended for most people with diabetes, high blood pressure and kidney disease. Recent studies suggest that ACE inhibitors, which include captopril and enalapril, slow kidney disease in addition to lowering blood pressure. And these drugs are helpful even for people who do not have high blood pressure. Protein increases how hard the kidneys work. Thus, another treatment some doctors use with patients who have large amounts of protein in their urine is a low-protein diet. A low-protein diet can reduce the amount of protein that gets through the filtering process to the urine. But you should never start a low-protein diet without talking to your health care team. Another trick is to concentrate on the protein you get from vegetables as the protein in animal products (meat, fish and dairy) is harder on the kidneys. End-stage renal disease (ESRD) is the complete and irreversible failure of your kidneys. 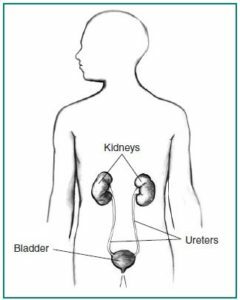 When your kidneys stop working completely, your body fills with extra water and waste products, a condition known as uraemia. You will feel tired and weak because your body needs clean blood to function properly. Your hands and feet may swell up. Untreated uraemia may lead to seizures or coma and will ultimately result in death, in just a few months at the most. To avoid this, you will need to undergo dialysis or kidney transplantation. Dialysis artificially removes waste products and extra fluid from your blood when your kidneys can no longer do this. The two major forms of dialysis are haemodialysis and peritoneal dialysis. In haemodialysis, your blood is sent through a filter that removes waste products. The clean blood is returned to your body. Hemodialysis is usually performed at a dialysis centre three times per week for 3 to 4 hours each session. In peritoneal dialysis, a fluid is put into your abdomen. This fluid captures the waste products from your blood. After a few hours, the fluid containing your body’s wastes is drained away. Then, a fresh bag of fluid is dripped into the abdomen. Patients can perform peritoneal dialysis themselves. Patients using continuous ambulatory peritoneal dialysis (CAPD) change fluid four times a day. Another form of peritoneal dialysis, called continuous cycling peritoneal dialysis (CCPD), can be performed at night with a machine that drains and refills the abdomen automatically. A kidney transplant involves surgery in which your diseased kidneys are removed and a healthy kidney from a donor is put in its place. The donated kidney may come from an anonymous donor who has recently died or from a living person, usually a relative. The kidney that you receive must be a good match for your body. The more the new kidney is “like” you then the less likely your immune system is to reject it. You will need to take special drugs for the rest of your life to help trick your immune system and keep it from rejecting the transplanted kidney. Regenerative medicine holds the potential to fully heal damaged tissues and organs, offering solutions for people who have conditions that today are beyond repair. For people with chronic kidney disease, new techniques that regenerate tissues and organs may be developed in the future to help slow the progression of the disease. Chronic kidney disease increases the risk of heart attacks and strokes. The progression of kidney disease can be slowed ― by keeping your blood glucose and blood pressure under control ― but it cannot always be reversed. Dialysis and transplantation can extend the lives of people with end-stage renal disease, ie the total loss of kidney function.